Creating a hue and cry among the Indian Olympic association and the chief of the mission, PK Muralidharan Raja was aggetated. After seeing that a girl in dress with no dress code came into the march past and was walking right infront of the Indian Olympic team. Not only did she grab all the attention but she was shabbily dressed for the occasion as well. It has been said that this mystery lady is Madhura Honey a post graduate from Bengaluru who is studying in London. 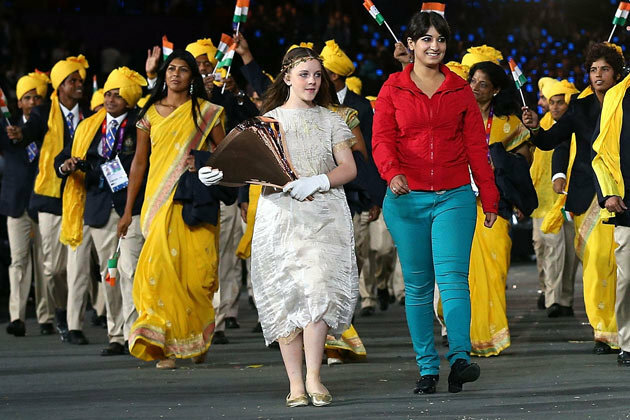 The daily reported her friend from the college was also baffled seeing her with the Indian contingent. She has been living in London and before she went with the Indian team, she had displayed her Olympic passes on her Facebook account. But once this became an issue, she had deactivated her Facebook account. London 2012 chief Sebastian Coe told a news conference on Sunday the woman was a member of the cast from the extravaganza but should not have been with the athletes.